The lure of using big data analytics has become vital for supply chain managers. Third party logistics (3PL) market is expected to witness profitable growth prospects, pertaining to the fact that the number of outsourcing activities undertaken by companies to reduce costs from supply chain is prominently increasing. 3PL companies work with shippers to transport their commodities to numerous locations in ways that are sufficiently cost-effective and suitable for the product. As per reliable statistics of 3PL industry, more than 95% of the Fortune 100 companies and more than 80% of the Fortune 500 companies use dedicated contract carriage, warehousing & distribution, domestic & international transportation management, and software services, which form the crux of the 3PL market service landscape. With more and more companies focusing on core business competencies and preferring to outsource their logistics operations, Third party logistics market is all set to experience a y-o-y growth rate of 4.4% over 2015-2022. Companies that provide solely packaging and warehousing and distribution services fall under this category. Only new entrants are known to provide these services, to establish their position in global third party logistics market. Most other providers are known to provide other value-added services. Warehousing and distribution is one of the prime services included under the service spectrum of 3PL industry. Warehousing & distribution services held more than 22% of the overall third party logistics market in 2014 and are anticipated to grow substantially over the next five years. These services are usually provided on long-term contracts and find extensive applications in end-use industries such as pharmaceuticals and food refrigeration. Many companies provide services such as cross docking, specialized packaging, and tracking and tracing, apart from the basic services. Third party logistics market players providing developed value-added services usually try to upgrade their service portfolio and enhance their business position. Customized services are offered by 3PL industry participants who take over the complete logistics of the firm. Of late, most companies have been offering high profile customized services. Top behemoths of 3PL market are known to provide these services. Here’s where the 3PL provider is officially integrated with the firm, and it takes over the whole logistics operation. Third party logistics industry size is anticipated to hit USD 1029.47 billion by 2022, driven by a number of factors such as increased IT consumerization, e-commerce penetration, reduced shipping costs. Leading providers have changed their growth strategies and are increasingly turning toward the deployment of software services, enhancing their distribution channel networks, and providing high quality services to clients. Third party logistics market landscape has undergone a number of transformations over the last few years, which will provide lucrative avenues for 3PL providers to enhance their service portfolio. 3PL market is likely to witness a slew of strategic mergers and acquisitions in the coming year. M&As have already played a vital role toward the growth of global 3PL industry. For instance, notable French 3PL market player, Norbert Dentressangle had acquired Jacobson Co., a contract packaging, logistics, and transportation management firm from its owner, Oak Hill Partners, leading U.S. private equity firm, in 2014, for a valuation of USD 750 million. This was considered Norbert Dentressangle’s penetration into U.S. third party logistics industry. Prominent 3PL market player, Armstrong and Associates, has also recently partnered with the Global Supply Chain Council and is slated to play host at the 2nd 3PL Value Creation Asia Summit to be held in Hong Kong. The summit aims to bring together leading investors and experts from third party logistics providers to discuss and propagate cutting edge technologies and bring about a phenomenal transformation in 3PL industry trends of 2017. 2017 is slated to witness many such M&As shaping the 3PL market, as they are characterized by business expansion, tech assets acquisitions, consumer base strengthening, and a diverse service offering. Increased number of M&As will lay out potential growth avenues for 3PL industry over the years to come. With the subsequent growth of cloud computing market, 3PL providers will make use of extensive cloud-based technologies that will enable businesses to store the massive influx of data, enable clients to access their systems, and improve the overall efficacy of the logistics operations. The emergence of big data analytics, smart technology, and data sharing will help impel 3PL market size over the next few years. It is estimated that data sharing will help improve tracking and tracing services across the supply chain. Also, estimates suggest that the amount of big data will grow from 3.2 to 40 zettabytes by the year 2020, which will subsequently help 3PL providers upgrade their services and focus on the key performance indicators. By the end of the next few years, it is expected that global economy would be fairly integrated. With a massive expansion of supply chain operations worldwide, the business landscape of 3PL industry is likely to get more complex. Experts state that 3PL market players will need to stay on top of the game in order to sustain their position. In addition, a fairly integrated global economy will lead to efficient inventory management, clarity and transparency with the supply chain, and heavy deployment of automation, which will push 3PL industry size over the coming five years. With economic globalization, it is also vital the countries understand the legal implications and regulatory compliance of one another. The emergence of new markets, currency exchange, and international trade will also act as growth indicators for 3PL market in the future. Additionally, with the increased penetration of mobile apps, customers will be able to track the details of their shipments and process freight shipments from anywhere, which will further fuel the industry trends. The growth of IoT (Internet of Thinsg) in retail market is expected to generate lucrative avenue for 3PL industry in the future. Online retailing has been gaining a significant traction globally, subject to which the requirement of warehouses and distribution spaces is on an incline, Retail giants have also been focusing on understanding the massive logistics operations without the exception of any detail. Bearing testimony to this is that fact that retail magnate Amazon has increased its distribution space by a stupendous 1000% in the last 10 years. A rapid increase in the demand for service such as warehouse & distribution, shipping, transportation, etc., is estimated to increase the valuation of 3PL market over the coming years. The latest trendsetting addition to the service spectrum of 3PL industry players is 4PL. A notch higher than 3PL, 4PL market comprises highly advanced storage, distribution, and procurement services. Similar to the customized service sphere of 3PL providers, 4PL companies also take over the entire logistics operations of the business. The services may also be provided as a part of the business or an entirely different venture that can be integrated into the business later. For instance, consider that a 4PL provider has to render services to a motorcycle importing firm. While the key operations of the firm will be limited to importing the products, the entire responsibility of managing the logistics operations for importing the spare parts for these motorcycles would be handled by the 4PL provider. Retail giants such as Amazon are likely to transform into a full-fledged 3PL provider. 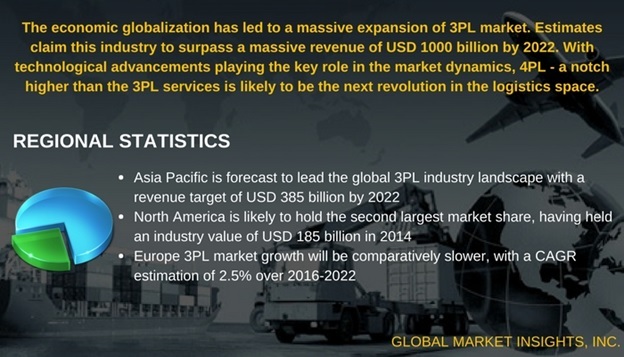 In addition, companies operating in the core transportation sector may also penetrate into global 3PL market. Key players operating in third party logistics industry such as J.B. Hunt, Deutsche Post DHL, Kuehne + Nagel, Expeditors International, and UPS Supply Chain Solutions will need to brace themselves for additional challenges and come up with a technologically advanced, upgraded service portfolio to sustain their business position. Global Market Insights, Inc. has a report titled “Third Party Logistics (3PL) Market Size By Service (Domestic Transportation Management, Dedicated Contract Carriage, International Transportation Management, Software, Warehousing & Distribution) Industry Outlook Report, Regional Analysis, Application Potential, Price Trends, Competitive Market Share & Forecast, 2016 – 2022” available at https://www.gminsights.com/industry-analysis/third-party-logistics-3pl-market-size .